Coilhouse » Blog Archive » Who else has seen SKYWHALES, damn it?! The very concept of skywhales is pretty amazing. There was a commercial recently for Sea World where the killer whales were swimming through a city and a big open field and I LOVED IT. So…they’re really hunting…each other? Themselves? More than a little trippy, and reminds me of all that was good about 80s fantasy. good lord. if 1983 year old me saw that, it would have damaged my sad little brain. i hate i missed it. cause 2008 year old me loves it! Wow! I thought I made that up! Cuz every time I talked about it with my cartoon friends nobody ever had any idea what it was, so here I’ve been figuring sheltered lil me made it up?! Cat number 3 has the same accent as the dwarf from Twin Peaks…I wonder if they’re friends. Skywhales is rad! It’s like Ralph Bakshi, Fantastic Planet, and The Point all rolled together…into a space doobie. Damn…. I too missed”Skywhales”the first time around, and I’m someone who prides himself on having seen alot of strange and wonderful animated shorts(“Hello Quasi!”). Skerror…. It’s been many a moon since anyone mentioned”The Point”! I vaguely remember an episode/issue of THE MAXX, where Maxx jolts in and out of our world and Pangea, and gets knocked by a skywhale, which is a Goodyear blimp in our world. @Paul – THE POINT. Wow. I believe the last time I saw The Point was in gradeschool somewhere. 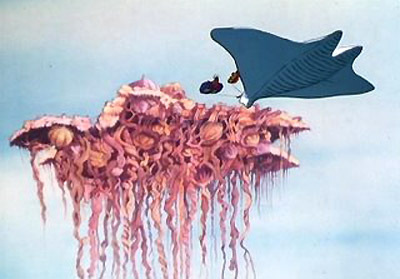 It was in that film that I was first introduced to the word,’decompose’ while a cartoon whale( there’s the connection! )was shown rotting to a skeleton. I’m most likely thinking of something else entirely. Three’s some very beautiful and imaginative background art in Skywhales! I guess I’ve had airborne sea creatures in my mind for a little while, mostly reinforced by alot of the comics I’ve read over the years. Anyone remember Rick Veitch’s “Abraxas and the Earthman”? “The Puma Blues” had those flying mantas…. I have THE POINT here somewhere on DVD. If needed, it can be set free on the intart00bs. Thanks for that , I haven’t seen that since it was on C4 in, well it must be 83. It really made a mark on me then. Wow!